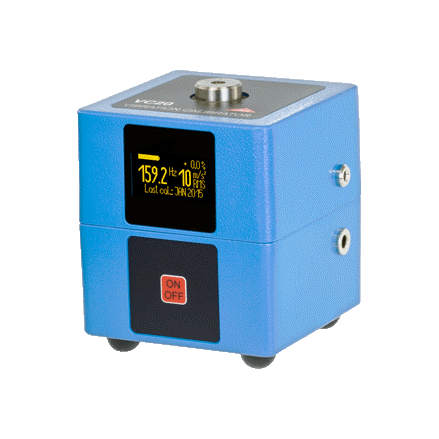 Stand alone calibrator with computer calibration control function. Testing and calibration in terms of acceleration, speed, movement. Adjustable frequency range 70...10 000Hz. Dimensions 205 x 105 x 90 mm³, weight 3 kg. Kit: Transport case, AC adapter (100 .. 240 V, 50/60 Hz, PC software, USB cable, threaded adapters (M5, M8, 1/4 "-28, UNF 10-32), BNC adapter / UNF 10-32 (mod. 017). 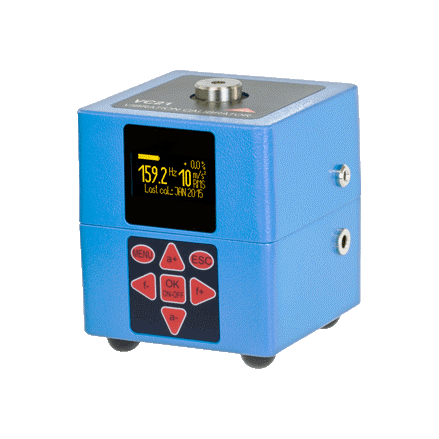 A series of stand-alone calibrators for single-point calibration (10 m / s2, 10 mm / s, 10 μm at 159.2 Hz) before calibration using 5-point vibration points at frequencies from 15.92 / 40/80 / 159.2 / 320/640/1280 Hz. 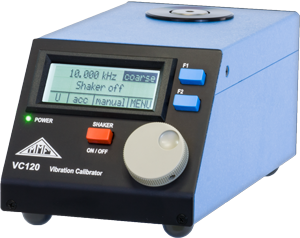 Calibration of vibration transducers by acceleration, speed and displacement. Calibration of eddy current sensors. 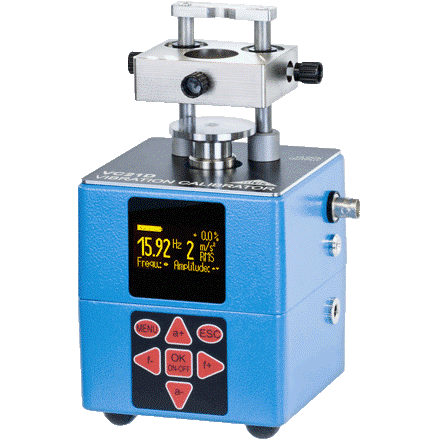 Calibration of measuring systems according to ISO 8041 (human exposure to vibration), to DIN 4150-3 (building vibration). Dimensions 100 x 100 x 120 mm ³, weight 2.2 kg. Kit: Plastic case, power adapter (100 .. 240 V AC; 50/60 Hz), threaded adapters (M3, M5, M8, 1/4 "-28, UNF 10-32) Set: Plastic case, power adapter (100 .. 240 V AC; 50/60 Hz), threaded adapters (M3, M5, M8, 1/4 "-28, UNF 10-32). Optional: Adapter with 3 holes 040 / M6 x 0.5 threaded adapters; M8x1; M10x1; M14x1; M20x1; 1/4 "-28; 3/8" -24; 1/2 "-20 (VC 21D).